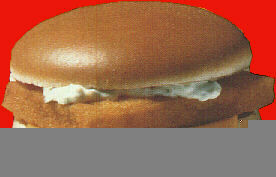 Is McDonald's a secretly run by communists? We have reason to believe so. Everyone knows that the arms race cost the USSR tons of money, which virtually led to the collapse of the country.� What everyone does not know is that shortly before the Soviet Union fell, McDonald's evil communist owners made a bid to actually purchase the country and this was to be the new flag. How else do you explain this? This is a book written by the president of McDonald's Canada, George Cohon.� I haven't actually read it, but I'm sure it's full of evil commie propaganda and such.� I mean, look at the cover!! Who else but a COMMUNIST would be that happy to be in Moscow? That's what I thought. 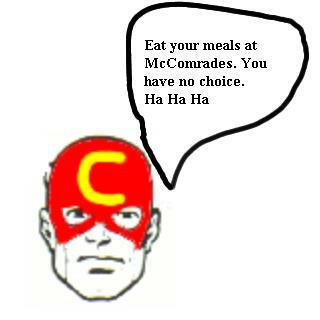 This is an ad campaign that was considered using popular Soviet super hero Cap'n Communism (the C stands for Communism). However these adds were only released in Russia. Or so we believe. I asked about it at the Russian embassy, but some scary guy with a cup of Borsch chased me away with a large spoon. Oh come on. Everyone knows, only commies eat fish.